A beautiful home privately located in an exquisite part of South Addison called Cape Split, where renowned artist, John Marin, painted extensively. His studio is still there. This exceptional home is situated on over 2 acres with deep water frontage on Pleasant Bay. 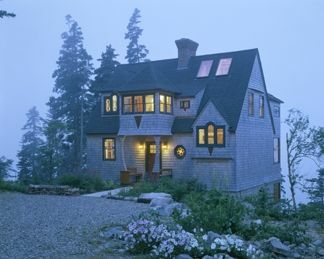 It is perched high, overlooking the ocean and islands of downeast Maine. Enjoy vistas of Cadillac Mountain, outrageous sunsets, soaring birds, varied boats, porpoises and seals amongst towering evergreens. Completely breathtaking! It is architecturally pleasing in and out, fine craftsmanship, loads of stained glass, central fireplace, new appliances, gorgeous bedrooms, cozy sun room with fir wainscoting and Brazilian cherry flooring. There is a sweet unique loft in the peak of the home. All linens are provided! There is also an ocean side deck with expansive views and outdoor seating.
' We love the house and spectacular views. Melted all our stress away!! We saw a 'Big' black bear less than a mile from the house walking across the road. WOW!!! Check out the article Coastal Living magazine did on this incredible oceanfront rental home. Issue May 2006 Guestbook Section pages 60-64. There is a deep extra comfy roman style tub w/ the best views possible! There is also a walk in shower. This spectacular home is centrally located downeast with easy access to other great Maine recreational destinations. We have a folder of ideas in the home. They include golfing amongst Maine's blueberry barrens at Barren View Golf Course or at Great Cove Golf Course, day tripping to Acadia National Park, Franklin D. Roosevelt's museum at Campobello Island, Canada, beaching at Roque Bluffs State Park, Sandy River Beach or famous Jasper Rock Beach in Machias. Visit Bartlett Winery, picturesque sea kayaking, nature conservatory's Great Wass Island preserve with trails. Visit quaint villages along the coast which boasts numerous specialties...lobstering, blueberrying, clam hatcheries and so on and of course the people with their delightful dialect and living 'the way life should be.' This downeast ambiance is guaranteed to give you relaxing and lasting memories. Golf: There are golf courses around the area. Bar Harbor Golf Course Trenton Me.